Long time no post! I've had lots of irons in the fire the last few months, but it is one of my FAVORITE seasons of the year .... TOMATO SANDWICH season! The only time I eat white bread. I wanted to give a shout out for the Dixie Classic Farmers Market Salsa Contest happening this Saturday. 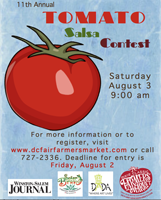 Salsa entries are due by 9am, judging begins at 9:30am with free public tastings! I am absolutely thrilled to be acting as a judge for the competition. I've been a judge at a gourmet iron man-style chef competition, chili cook-offs, and a Mac & Cheese Fest and I'm excited to add salsa made from fresh Southern tomatoes to the list! There is still time to enter! Entry form here. First prize winner takes home $100 cash, Second place = $75 and Third place = $25 and all winners will be awarded ribbons. I'll be sure to add photos of the contest and announce the winner! Can't make it Saturday but still need your fresh tomato fix? First Friday Gallery Hop August 2nd from 7-8pm the Winston-Salem Journal will again host their annual "Slice of Summer" Tomato Tasting on Trade Street in the Winston-Salem Downtown Arts District with food editor, Michael Hastings. 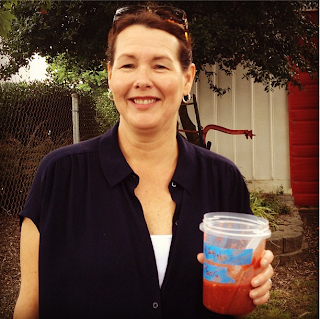 Also on hand will be author Miriam Rubin, signing copies of her book Tomatoes, a Savor the South Cookbook. Also, the results of the Slice of Summer Tomato Tasting are in! First place went to Mountain Magic variety, 2nd place = Sun Sugar, and third place went to Aunt Ruby's German Green. For full details, see the Winston-Salem Journal article.